High quality products to keep your African Grey Parrot & Timneh African Grey Parrot healthy and stimulated. Find everything you need for your African Grey Parrot. The largest selection of food & treats, toys, supplements, cages and accessories for your African Grey & Timneh parrots. FREE Delivery on orders over £39! Choosing a varied and healthy diet for your African Grey can seem like a daunting task with the wide variety of different foods out there. We have a large selection of high quality seed diets and complete pelleted food, perfect for your African Grey needs. If you have a breeding pair of Parrots, there are also several special breeder diets and hand rearing food to start your young Parrots off right. When feeding your Parrot, a variety of fruits, vegetables, and sprouting seeds, you’re providing them the key to a nutritional diet and overall, a happy and healthy Parrot. Sometimes, feedings aren’t as easy to accomplish, especially if your African Grey is fussy about food. To top up your Parrot’s nutritional needs To top up your Parrot's nutritional needs, we offer a great range of vitamins, minerals and supplements for pet parrots. As an owner, you more than likely know Timneh and Congo African Grey Parrots are very intelligent! Your African Grey needs lots of interaction, toys, and accessories to help them curb their boredom. We have hundreds of toys for your African Grey to play with and enjoy. 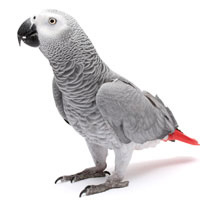 Keeping your African Grey mentally stimulated is essential and you can choose from activities, challenging tricks, and even toy making kits that allow you and your parrot to spend time enriching their life and your bond together. Making sure your African Grey stays entertained goes hand in hand with one of the most important things to consider when accommodating your parrot. Making sure they have enough room to move about and play with their toys is important, so make sure you are choosing the biggest cage possible. Keep in mind, cage size is crucial, but making sure they spend time outside their cage is just as necessary! How can you accomplish this? Invest in a Parrot stand. Having a Parrot stand means your Parrot will have somewhere safe to play while they’re away from their cage. There are many shapes, sizes, and types of stands to choose from. Whether you and your African Grey are just starting life together or you’ve had a bond for quite some time, you’ll find all that you need for your Parrot and your budding (or lasting) friendship.